Sallis Benney Theatre is an Impressive venue with expansive production equipment and a helpful experienced team, located in the heart of Brighton, Just minutes from the iconic palace pier and almost opposite the striking façade of the royal pavilion, grand parade offers a variety of conference and event spaces. 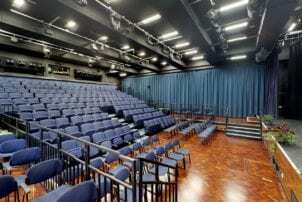 It is home to the versatile Sallis Benney Theatre – seating up to 270 guests – as well as the University of Brighton Gallery and a number of lecture theatres and seminar rooms. The Sallis Benney Theatre is a key venue for exciting live events in the city including theatre, comedy, dance and live music. The space is also ideal for seminars, conferences and awards ceremonies. The Grand Parade team can provide a range of refreshments for your delegates, from light snacks to hot or cold buffets, or even full banquets. The site is within 10 minutes’ walk of Brighton train station, and there are plenty of pay parking options nearby.